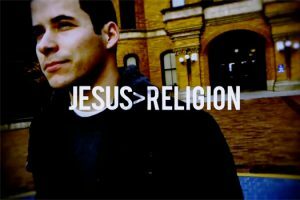 As the viral video “Why I Hate Religion, But Love Jesus,” by Jefferson Bethke, approaches 18 million views, I will add my response into the clutter. I’ve seen pro-life responses. I’ve seen Catholic exceptionalism responses. I’ve seen atheist and non-Christian responses that agree but then have their own conclusions. I am not interested in getting into theological debate, or in driving wedges between people. I want to make a simple point. It’s the same point I often make to friends who say they’re spiritual but not religious. And to some atheist friends right after they’ve explained why they don’t believe in God. It is this: What you are calling religion is not what I call religion, and it is not the definition of religion. The God you blame or are angry at or don’t believe in is not my God. You’re experience is real, without a doubt. And I honor that. You are speaking from hurt. Your encounters with religion, as given to you by parents and authority figures, were messed up. And there’s no question that Jesus devoted a lot of attention to denouncing those types of religious behavior and expression. But the religion that hurt you or disappointed you is not all organized religion. You’re experience is real, without a doubt. And I honor that. You are speaking from hurt. Your encounters with religion, as given to you by parents and authority figures, were messed up. And there’s no question that Jesus devoted a lot of attention to denouncing those types of religious behavior and expression. But the religion that hurt you or disappointed you is not all organized religion. What we call a religion is made up of three things: belief that there’s something more than this material world; a set of ethics and moral guidance; and rites and shared rituals. Different organized religions put emphasis on one or another of the three, but each is a mixture of them all. Ritual without the spiritual dimension is bereft and can be dangerous. Law without the spiritual dimension is at best difficult to maintain, at times punitive and harsh, and can be offensively hypocritical. What you’re railing against is an experience of organized religion that was empty ritual and harsh hypocritical law. So you’re not criticizing religion; you’re criticizing an expression of religion that doesn’t live up to the definition. I’ve had encounters with religious expressions like that. But I also know beautiful, amazing expressions of religion that are overflowing with love. While a religion in the broad sense is that combination of spirituality, ritual and law, a religion on the ground is made up of people — fallible, silly, broken people. This is slightly tricky ground, I admit. I’m saying that a group of people who come together to worship God collectively is a divinely inspired thing, and at the same time a jumble of flawed humans who can individually do profoundly stupid stuff. If individuals do hypocritical or hateful things in the name of a religion, that doesn’t make the religion hypocritical or hateful. Even if the institutional expression of the religion, a church bureaucracy, does profoundly stupid things, that’s still people doing them. We can debate over how much or how little hierarchy a religion should have, but it’s always made up of people. And it is not when leaders are imperfect but when they lack the humility to remember they’re flawed humans that much of the trouble comes. One more point — an obvious one that some of those who’ve responded have already brought up: it’s easy to mention the wars and division and oppression that have occurred in the name of religion. But if you’re going to try to blame all that stuff on religion, then you also need to acknowledge all the charity, and the abolition of slavery, and the civil rights movement, and the billions of acts of kindness and compassion inspired by religion. So, of course there’s lots wrong with organized religions. But there’s lots right too. People like to have black and white answers, embrace some things unquestioningly and denounce others blindly. But that’s not the world. The world is a messy place. And that’s part of what’s so awesome about it. I celebrate your obviously passionate faith. And I agree with many of your complaints. But I choose to focus what energy I have on building up what’s beautiful in love. Phil- a deftly written response to the ” Why I hate Religion” notion. Your points are well taken, and provide such a positive view point. I completely agree…Religion is complicated and sometimes we see the frailities of humans on display in any hierarchy…and the Church is no exception. Yet choosing to focus on and build up all that is good- and embrace the love and goodness that Religion and yes- The Church- have to offer is a recipe for joy in the midst of our faith. Thank you for sharing your insightful thoughts. Jane K.
Where’s the church, who took the steeple? Its the Muslim in him, she’s Catholic aint she? Peace, Rasta-man, I aint gotta clue! The things that are good about religion and religious people are good in ALL religions, religious people. The things that are bad about religion and religious people are bad about ALL religions, religious people. I am so over this SBNR v. Doctrine/Dogma stuff. God is SO much bigger than all this pettiness. The word ‘religion’ comes from the Latin ‘religio’ meaning to be ‘rebound’. We are rebound to Jesus through his life, teaching, death and resurrection. Thus, St. James’ statement in his epistle regarding religion (James 1:27) makes sense to the Christian as it describes the life of one who is indeed rebound to and following Jesus. Or, rather, we are rebound to GOD through the life, teaching, death and resurrection of Jesus. Actually, the notion that one needed to be re-bound to G-d has never made much sense to me. What kind of G-d from which all creation sprang could ever be separated from that creation? I appreciate the definition of religion offered here. I think it’s pretty much on target. I would add the experience of human beings and the traditions which have calcified around the three elements you mention are important functional aspects as well. The prophetic tends to arise from the experiential and frequently challenges the calcified traditional aspects. BTW, I appreciated the hint of critical approach to religion in the original video even if it ended up reverting to automaton evangelicalism before it got finished. “Bound” for Glory: I just read Harry’s comment and so totally agree with his very first two sentences. G_d is not separate from Creation. This means we are part of that greater whole, and that we carry Divinity within. The task is to separate the wheat from the chaff, meaning it could be, everyone is G_d speaking, and not in metaphor, but really, truly. Our job is to take those with words of hate, divisiveness, and mean and cruel words, and acts, and not embrace those things. We need to do what Ruth did, what the ancients did in the fields that were allocated to them, and to weed out the POV, Poverty of Ideas, that Point of View, from what is golden, the wheat, what rises within us all, that One Song, that is about LOVE, the compass in compassion itself. I totally agree that so much in religious communities of all kinds is about working to change the world in positive ways, about gifting each other. And I also see, that atheists do keep us honest in that terrible things have been done in the name of religion. I do deeply believe it’s ALL G_D. To see this perhaps takes profound journey, of SOUL. Great piece! I love this!!!! Thank you SO very much for sharing it with us all. This is so perfectly written and spot on. I wish I could just carry this with me for all the times this debate comes up in my life (which seems far too often). Thank you so much for writing this. “Good” is mentioned in several of the foregoing remarks. My question is what is good, or who is good? Then when good is defined……how good is good enough to ensure a right relationship with God? The Church is not a museum for saints, it’s a hospital for sinners. Every century has its Judases and its saints. What’s amazing is that the doctrine and sacraments of the faith remain the same and consistent, even if some people fail to respond to grace and make a mockery of their religion. The Catholic Church should have imploded a long time ago, yet it has outlasted ancient empires and kingdoms despite our best efforts to destroy ourselves. That’s empirical evidence that a Savior is at work. An excellent response. And so human. Thank you so much for writing this very God-inspired piece. May God continue to bless you and inspire your writing. Religions are like the people in them, both horridly flawed and amazingly beautiful. You made your point well.